Prosecutors have indicted Kamal Diab, who killed two women and a baby while driving under the influence. The charge: murder. An indictment was submitted Sunday morning against Kamal Diab, the driver of a truck who struck a car at the Pardis Junction in the north, killing two women and a baby. 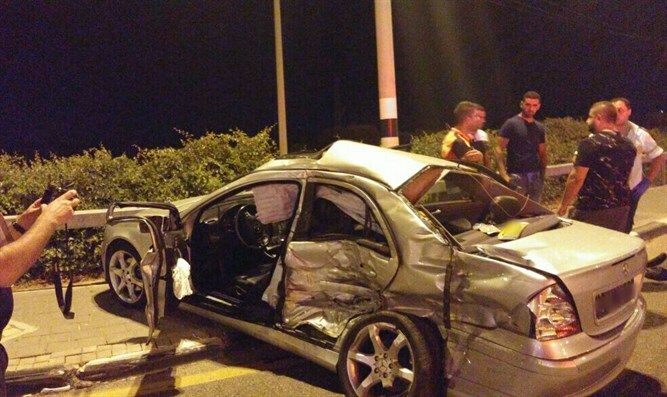 Diab, a resident of Haifa, has been indicted for three counts of second degree murder, driving under the influence of drugs, and crossing an intersection against a red light and causing serious injury. The indictment tells the story: On the night of August 2, Diab was driving a truck on Highway 4 from south to north. At the same time, Ramsay Ashkar drove down Highway 70 in a private care, with Said Naim sitting next to him. In the back seat, on the left, sat Angelique Naim. Also in the back, on the right, sat Olga Ashkar, and between them, in a car seat, sat the 1-year-8-month old daughter of Angelique. Angelique and Olga were sisters. When Ramsay arrived at the junction he stopped, as the first car in line, and waited until the traffic light changed to green. Diam was speeding his truck toward the junction with Highway 70, near the entrance to Pardis village, while under the influence of heroin-class drugs. When he reached the intersection, he kept driving, despite the red-light traffic signal. Diab crossed the intersection, and the nose of the truck struck the private car entering the intersection. The car was pushed to the opposite side of the road while spinning, and a sleeping Olga was thrown from the car and struck the tarmac. The car stopped only after it struck a wall on the opposite side of the road. Diab did not brake the truck, and continued driving until he stopped around 180 meters from the accident. As a result of the accident, Olga, Angelique, and the baby were killed. Ramsay, the driver, was critically injured, suffering from head and chest wounds, as well as multiple fractures. Said was struck in the head, and his facial bones and nose were broken. Ramsay and Said are still being treated at Rambam Hospital in Haifa.